OH YEAH BABY. Just look at those cookies! Are you drooling yet? Well, trust me, they are drool worthy. I’m not kidding here, these are totally worth every single calorie in them! While these tasty nuggets of pumpkin, spice, and everything nice, are fantastic anytime, they would also be a massive hit on your Thanksgiving Dessert Buffet. Why not think ahead? Santa would be happy to down a couple of these before dropping off presents! Do you have an upcoming Christmas Cookie Exchange? Well, these taste amazing, are a wonderful gluten free option, and probably due to the pumpkin, keep extremely well, getting softer over time. So feel free to pre-bake and take, knowing they will be even better a day later! First, whisk together the dry ingredients: Flour, baking powder, cream of tartar, salt, cinnamon, nutmeg and ginger. Then, in your stand mixer (or hand mixer) beat the butter with the sugars until light and fluffy, add egg, pumpkin puree and vanilla. Mix well. Set these ingredients in the refrigerator while you make the stuffing. In a clean bowl, beat the softened cream cheese with the sugar and vanilla. Do not over mix this. You are not whipping it, just mixing it altogether. Now is the tricky part, though not difficult. This dough is a little soft, but not super sticky, you’ll understand what I mean when you make them. They are softer than a traditional snickerdoodle, so if your kitchen is not cool, that little time in the fridge does wonders to firm up the dough a bit. Using a teaspoon or dough scoop (I use a small muffin-cookie scoop which is kind of like an ice cream scooper), take 2 small wads of dough (a little under a tablespoon each) and slightly flatten. Then take a tsp of the cream cheese mix, lay it in-between the 2 pieces of dough and gently press/pinch the seams together to make a slightly flattened ball. My first batch, I rolled into a circular ball like I would a traditional snickerdoodle, and the cookies baked up too tall. When I used this flatten/pinch-to-seal technique, the end result was a more traditional looking cookie. Can you see the difference in the picture below? The one on the top was a wad of cheese that I wrapped the dough around. The flatter, more traditional cookies are a result of my modified technique. Roll (or flip) the dough ball in the maple cinnamon sugar. Place on your baking sheet and bake 10-12 minutes. They may, or may not develop cracks. The cookie will be moist but not raw when done. Remove to a cooking rack and let cool, if you can wait that long. Half were gone before I finished baking them all! These cookies do not disappoint. I think how many you end up with, will depend on how big of a cookie you roll. I was able to end up with just under 2 dozen cookies. Enjoy, and as always, I’d love to hear your feedback or answer any questions in the comment section! Well, they tasted mighty tasty also! One of my younger friends from church had a sweet baby girl who joins her other two, all born in three years, so you can imagine there are moments when a gift of treats is appreciated in the hustle and bustle of her home. I promised her my ‘famous scones‘, blueberry lemon, but in addition I wanted to be able to send along a second little gluten free sweet treat her little ones would enjoy. I was eyeing my worn copy of Maida Heatter’s Book of Great Cookies and flipping through this recipe caught my eye to try gluten free. So I baked these up and I am impressed! Right out of the oven they were warm, chewy, having a lovely spice to them. The mace adds a slight hint of citrus which is not only delicious, but unexpected. Your friends will be puzzled, trying to figure out that ‘mystery ingredient’. 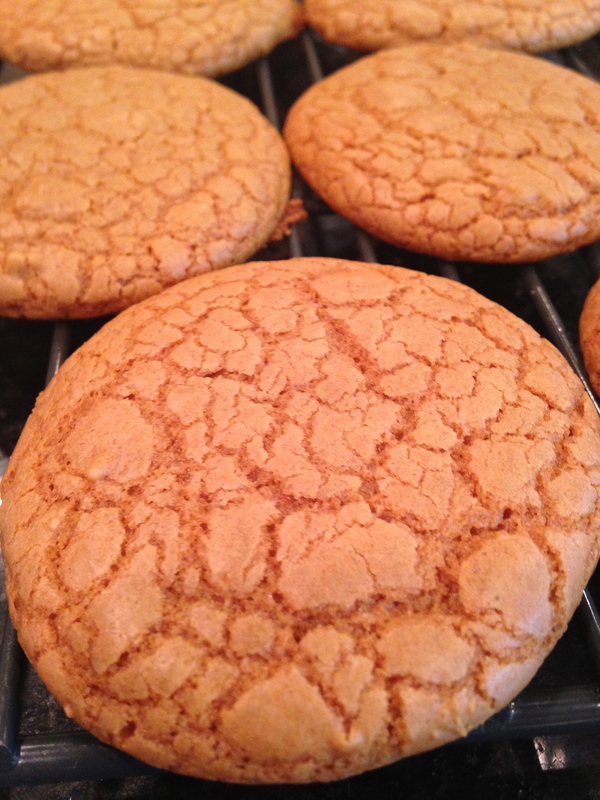 After cooling and storing away in ziploc bags, they became more like a ginger snap. These would make for a wonderful base for a pie, much like you would do for graham cracker or chocolate wafers, or crumbled on yogurt or ice cream. They are particularly nice because they are so incredibly easy to prepare, would be a lovely addition to a holiday cookie exchange, be welcome as a gift of comfort, or simply a quick and easy treat for yourself or your family. Preheat the oven to 375, and use either a silpat or non-stick parchment to line your baking sheets. Combine the dry ingredients and whisk to fluff and combine thoroughly. Whisk together the egg and vanilla. When the sugar/butter are cool enough to touch, add a drizzle of the sugar mixture to the egg and mix as you add. (this will ‘temper’ the egg, to prevent scrambling if the mixture is still too hot) Add another dollop, whisking as you add. Then you can add this egg mixture back to the pot and mix to combine. Add the dry ingredients and mix thoroughly, a sturdy wooden spoon works well here. Using a teaspoon, drop in to dollops on your prepared baking sheets, leaving about 2 inches for spread. (You can gauge how much they spread after you first batch and then adjust the number you can fit on a sheet.) Bake for 8-10 minutes, rotating the pan half way through baking. If you have 2 sheets in your oven, rotate front to back as well as top to bottom. These cookies are better undercooked, rather than overcooked. Overcooked won’t ruin them, they are delicious dipped in your coffee, but they will be crisp. Undercooking keeps them a bit chewy after a day. When done, let sit on the sheet for a minute to set, then with a spatula that is as wide as the cookie, remove to a cooling rack. There will be a bit of stickiness on the bottom of the cookie, don’t panic. Just clean the spatula in-between cookies, but as they cool, they will release faster. *if you have any questions, please post in the comments below and I will get back to you as soon as possible!